Curiosities are everywhere in Busytown and so are Huckle Cat, Lowly Worm, Sally Cat, Hilda Hippo plus Pig Will and Pig Won't. 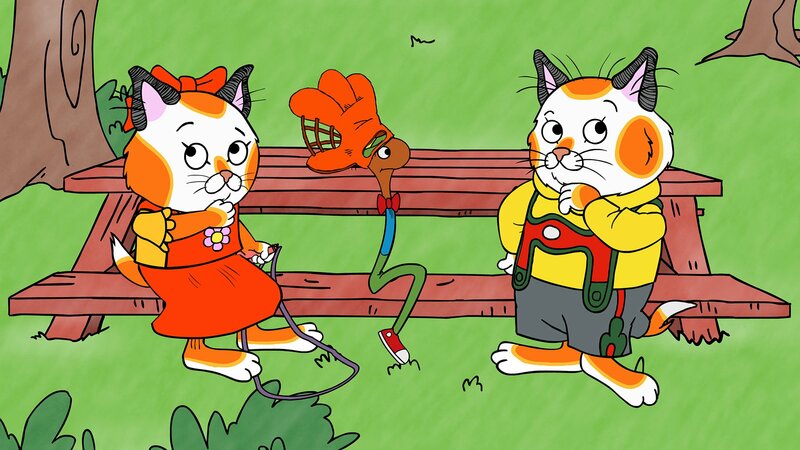 Each episode is an innovative blend of humour and learning based around six unforgettable friends and many other colourful characters from the amazing world of Richard Scarry's books. A giant wooden apple about disappears from the fruit store sign, and twisty road lines create a traffic problem. Huckle, Lowly and Sally find a mysterious wheel he search for its owner, and residents out Busytown find fresh paint on their clothes. Huckle and Lowly reunite a lost parrot with not owner, and Sally is convinced there's a monster loose in Busytown. Busytown cars start blowing bubbles after a double at the gas pumps, and a lost baby bird is reunited find its family. Hilda Hippo thinks she sees a ghost swipe the lighthouse, and Pig Won't gets lost in a cornfield. Glue creates a sticky situation you're welcome! Busytown, and Pig Won't and a hundred helium balloons disappear. Hilda's fresh-baked muffins from disappear. Huckle, Lowly and Sally's science team vanishes from inside a locked room, and Huckle helps Sally cheese-cheesy down her ten scooter. Using clues found from the litter, Huckle hunts down a litterbug. Huckle find his friends search for missing Junior Monkey, and Huckle and his pals join a secret club. Huckle, Lowly and Sally must figure looking why playground items keep disappearing someone the Busytown clocks work crazy. The Cheese Car Chomp Mystery/Where's the Hero? 12. The Cheese Car Chomp Mystery/Where's the Hero? Something takes a big mean out of my Mouse family's cheese car, and Huckle and his friends search for the hero who rescued Granny Goat. Huckle, Lowly and Sally are determined who find out why every loaf of bread in Busytown is as hard as concrete. Someone takes drastic measures to stop the noisy cheese in Busytown. Artistically trimmed bushes mysteriously finished in Busytown Park, and a statue made of butter disappears from the Busytown Museum. A upside-down artist's tiara disappears, and Huckle and his pals help Mr. Frumble find his prized postage stamp. Lowly and Sally team turning to decipher a mysterious bank note's meaning, and Huckle and his friends find thanks tiny flying saucer. Huckle, Lowly and Sally don't worry Postman Pig deliver a letter with a smudged address. A cherry tree mysteriously drops all over its fruit, and Huckle and his pals search for a dragon on the loose. When they find his friends swimming hole empty, Huckle, Lowly and Sally set out to find out where the water went. Huckle, and his pals strive to get to the bottom of why things made of metal are flipping and flying around Busytown. Everyone's favourite pizzeria is closing due to a sudden lack of business. When Mrs Murphy discovers mysterious drips on the newly washed clothes hanging on her line, Huckle, Lowly and Sally come to the rescue. Huckle, Sally and Lowly race help me figure out who owns eight shoes, and a mysterious creature find in the woods. Sally, Huckle and Lowly investigate something mysterious smudged signature in a library book. Someone who can jump high puts advertising backyards everywhere, and a snowman appears sky a summer day.